Today was the first day of the new project build. Spirits were high as two new hires joined our crew. I spent most of the day under my welding helmet, working on the wagon wheels and the happy horse. Together we made great progress on a variety of projects! By tomorrow afternoon the wagon should be ready for the sculpted concrete. 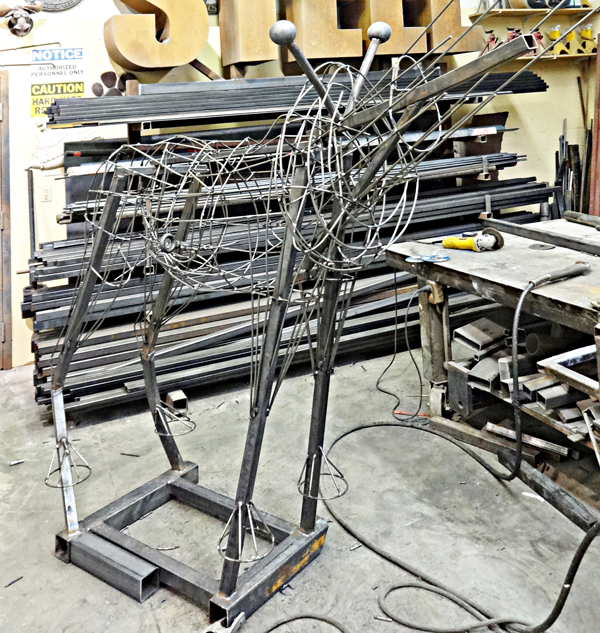 While the boys wired the wagon I was busy in the shop starting the welding on the happy horse. First came the structural steel, good and strong to withstand thousands of rides through the years. Then came the pencil rod outline. The equine has a ways to go before he is done. Tomorrow the horse will get a mesh skin and then be ready for the sculpted concrete. I'm already starting to think about the next piece we'll start soon.